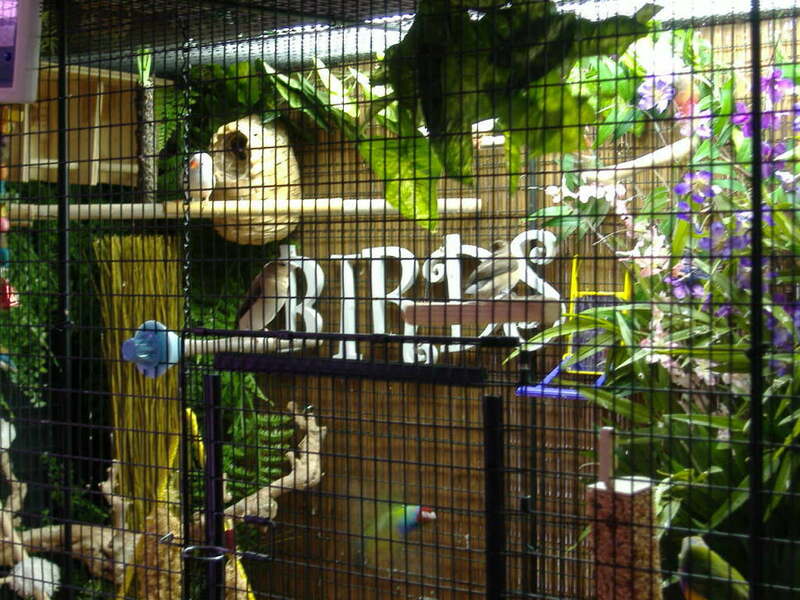 Setting up cages for finches is fun, unlike hookbills finches don't chew up everything so you can add a lot of stuff. The decorations are a lot of artificial plants with pretty colors, they use them to hide in and some even make a nest in them. I put my nests in the plants so the finches have some privacy. I arrange them at the top and along the sides of my cages. Finches also like some light in the room in case at night they get scared they can't see in the dark to get back to their perch. You can leave a night light on or string some Christmas lights to give off a small glow. I also use untreated tree limbs from my yard especially after a storm has blown them down. The finches like to sit on them better than regular perches and the different size's are better for their feet. 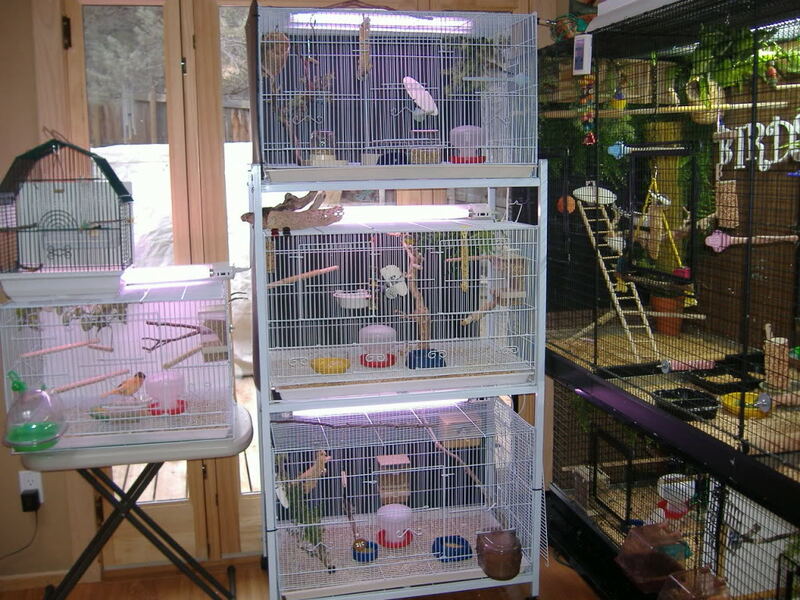 Just remember to not put perches over food or water dishes and position them so they have flying room. 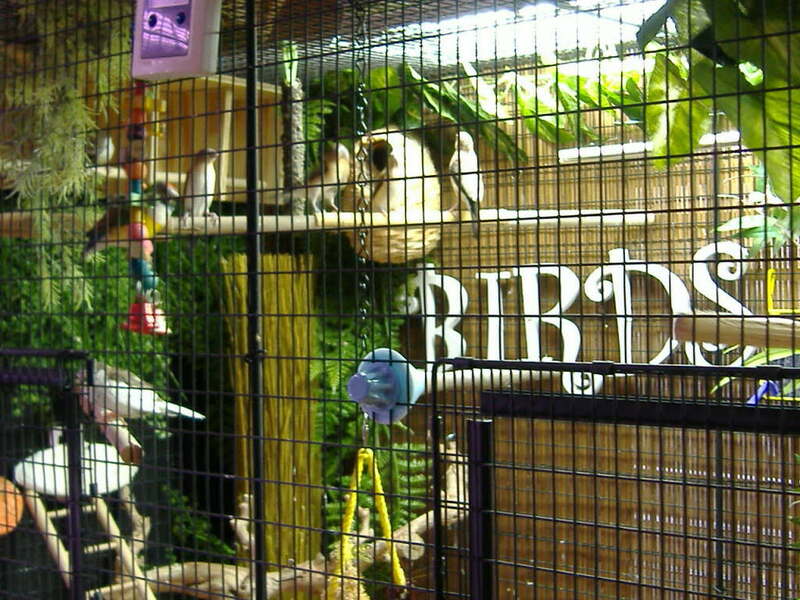 If your bird area is big enough you could add a bird feeder like the ones people use outside, or a small water fall in the bottom. I really like that HUGE cage. and would really like to have one like yours. 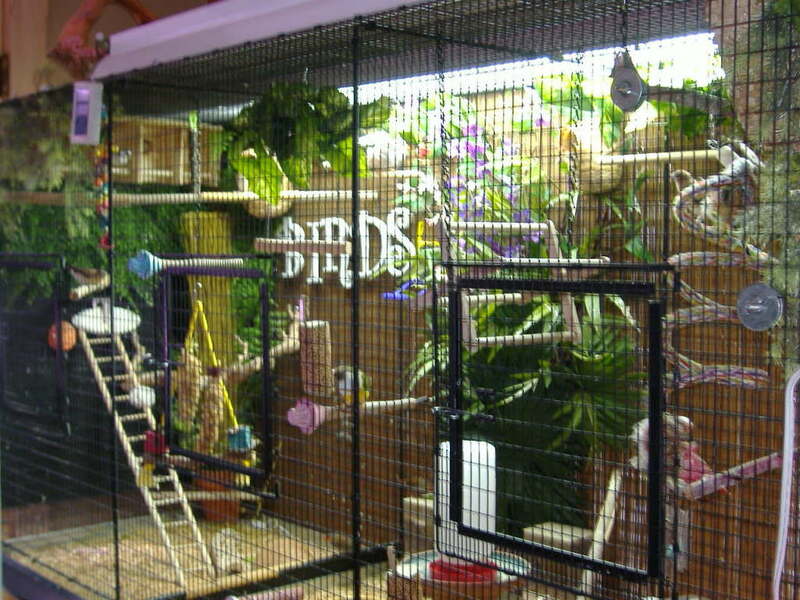 Then I could get more finches. and I love your cage!!! You have so many neat bird things in there too. I want to point my finger at the screen and ask you questions. So I will try writing it, what is the white wooden thing, it looks like a small wooden chair. Is that a hanging feeder, (it's black and flat). What are you using on the bottom? Where did you get the smaller feeders in the bottom of the white cages? I am so jealous of your beautiful set up, I would really like to have a avairy like yours. for posting all the pictures. Not sure what white wooden thing you are asking about. What photo is it in? I added lots of things for them to play on sometimes I think I have to much in there but they don't seem to mind. Its in the 5th picture. The smaller feeder dishes I found at Petsmart in the hamster dept. they are perfect for bird treats etc. Some I also got at Walmart for gerbals. The mushroom style things are water dishes I got on Lady Gouldians. I use a variety of dishes some are from frozen food items that can hold treats, greens, egg food etc. Is it hanging on two chains? If it is its a ferris wheel of sorts. When a bird lands on it it spins around. Thanks for the info. I never thought of of looking in the hampster department, that is a good idea, I have been looking for something like that. 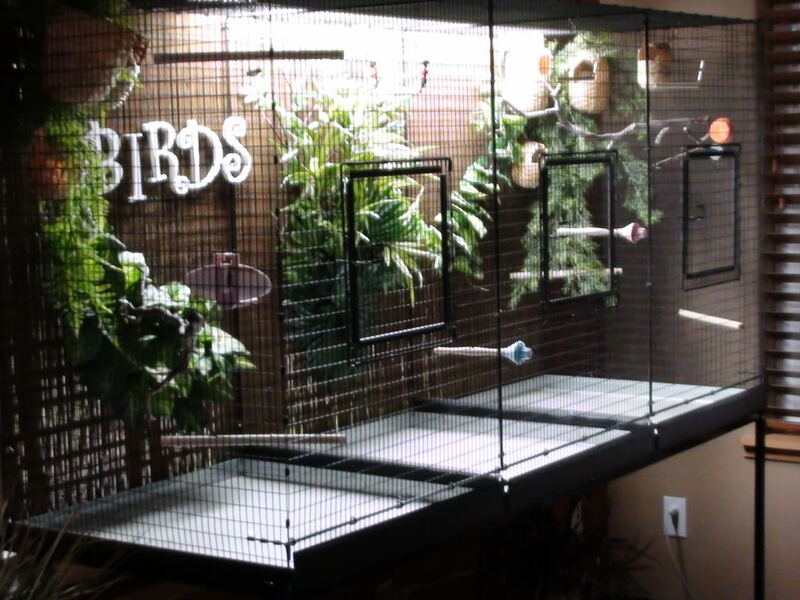 I have the hanging feeder but wanted something to put on the cage floor. I think its on two chains, very cute. I like all the things you have in there it keeps your birds busy and happy. some of the dishes are the bottoms of flower pots which work really well for treats and stuff. Did you see my enclosed bath? I found the jug at Walmart in the storage container dept. I laid it on its side and cut a hole and it always at least 6 birds to enter and bath at once. It works great and keeps the water inside and not on the floor. 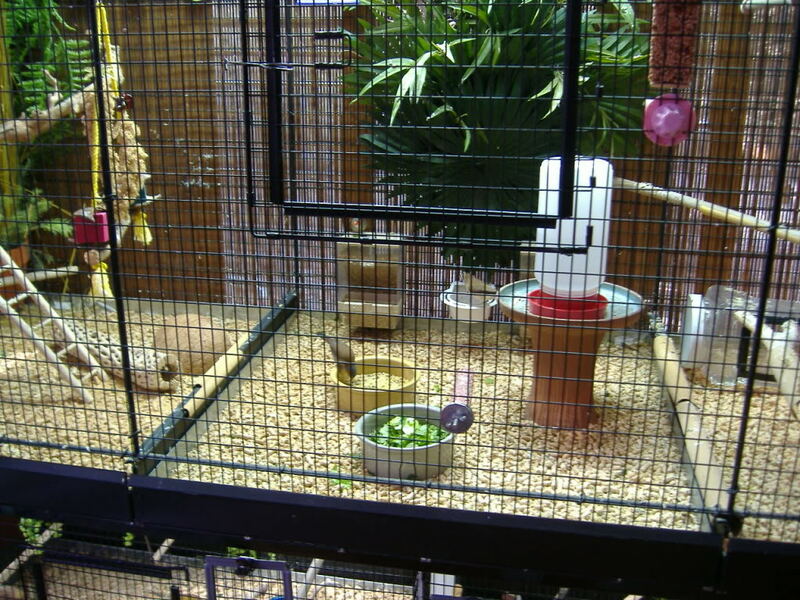 I have made several smaller ones from plastic peanut jars for smaller cages. What a great idea! 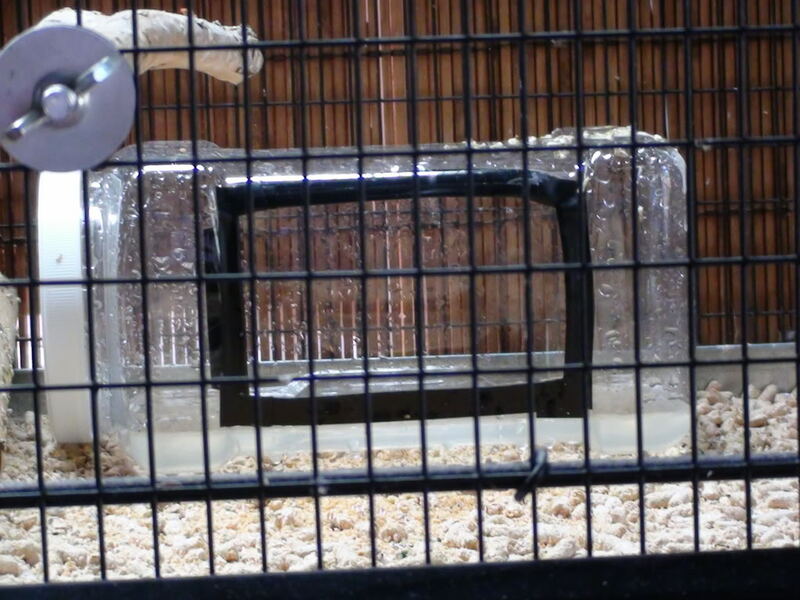 I do get tired of all the water being splashed out of the cage. 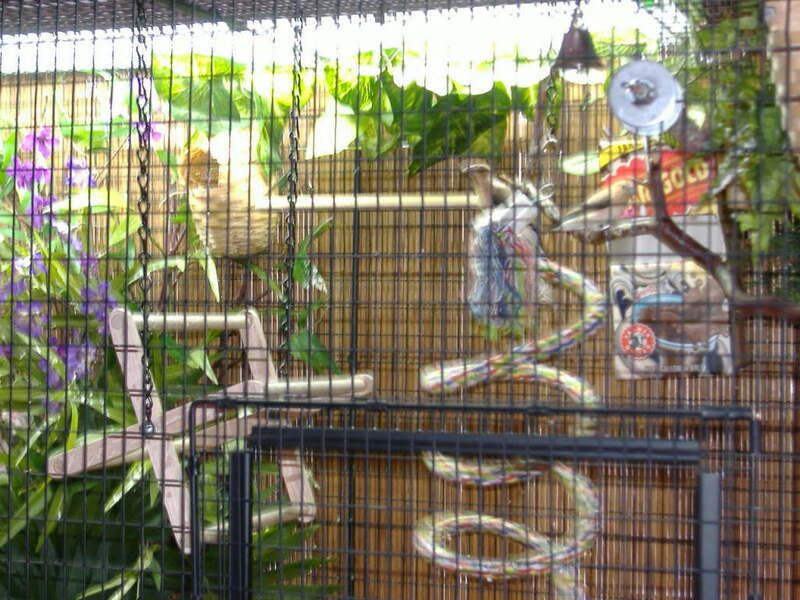 I have on that hangs on the outside of the cage but the societies would not go near it and it doesn't fit good. 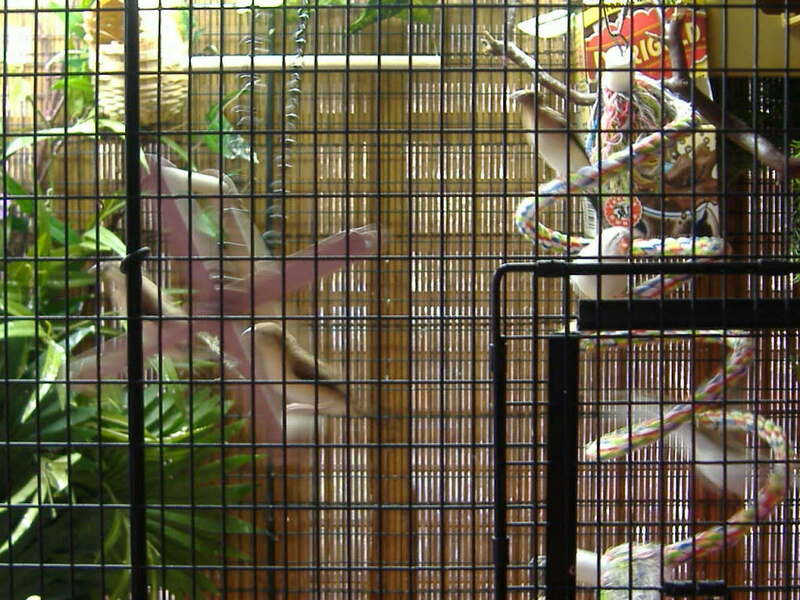 When you first put it in the cage did the birds freak out and did it take long before they got in? I am going to make one big one and then some smaller ones. Thanks for letting me know. I have the image in my head of the birds lining up to take a bath. I have been looking around the house for a plastic container to use but the ones I have or full, guess I will make a trip to the Dollar store and see what I can find.